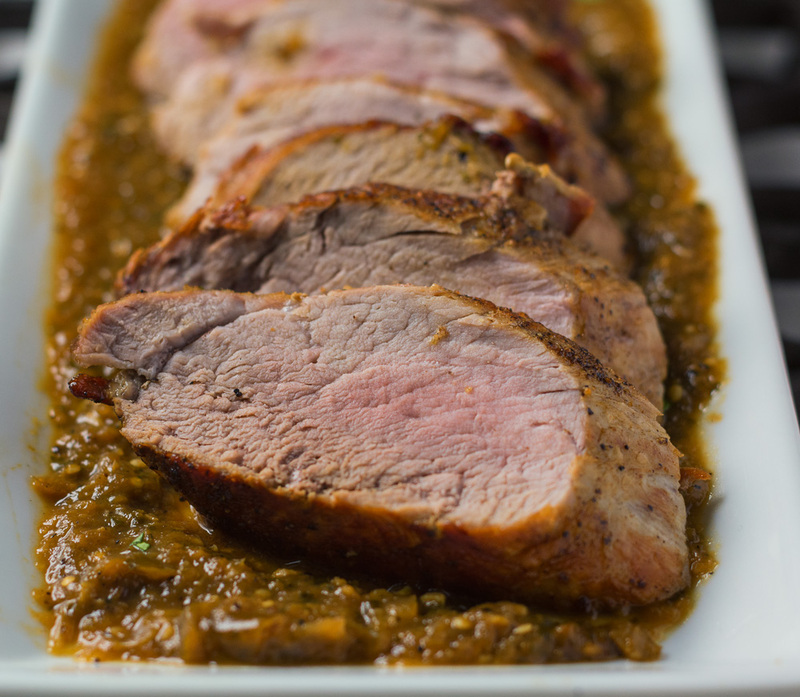 If you have the tomatillo salsa on hand, roasted pork with tomatillo sauce is a quick and easy meal. The salsa darkens as it cooks in the rendered pork fat. The sauce picks up the flavours of the meat to really come together nicely. 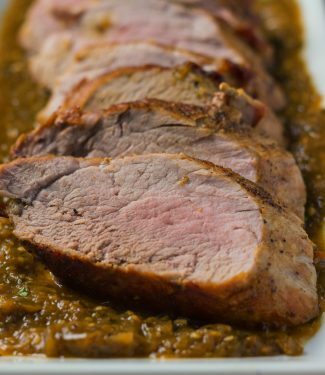 I used pork tenderloin because I was jammed for time but you could do it with a small pork loin as well. Just up the amount of tomatillo salsa you use to line up with the amount of meat you are preparing. If you want to build a menu around the tomatillo salsa (to make it worth your while) consider serving some nachos. Just substitute the tomatillo salsa for red salsa. You could make tortilla soup and spoon in a bit of the salsa as a garnish. Lots of possibilities. Pre-heat your oven to 385F. In an oven-proof skillet heat the oil and sear the pork on all sides. Place pork in the oven. You are looking for an internal temp of 135F. This is about 10 minutes for the tenderloin. Likely around an hour or so for the pork loin. Remove pork from oven. Remove pork from pan and tent with foil. Place pan over medium heat, deglaze the pan with the tomatillo salsa, stirring constantly. Fry the tomatillo salsa for about 1 minute. If the sauce is too thick add a few Tbsp chicken stock. Carve the pork. Return any accumulated juices to the sauce and stir. You can buy tomatillo salsa. That works. Tomatillo sauce from scratch works better.